Are you looking to leave a lasting impression on your wedding day without outshining the beautiful bride? Look no further than the men’s Benchmark four-sided titanium wedding ring with horizontal grooves. This designer wedding band exudes masculinity and sophistication, with the added advantage of an architectural design. If you’re not too familiar with titanium, it’s quickly becoming one of the most popular alternatives to platinum, palladium, and other precious metals. For an affordable price, you get superior scratch resistance, as well as the highest strength-to-weight ratio of any transition metal. Our 7mm men’s Benchmark four-sided titanium wedding ring with horizontal grooves looks utterly stunning from every angle. We used only the finest aircraft-grade titanium to design this ring, and the interior was crafted from extra metal to create a domed effect that is comfortable to wear. Sit back, relax, and enjoy a stolen moment or two with your soon-to-be-spouse. JustMensRings.com is proud to be a part of your big day, and our 7mm men’s Benchmark four-sided titanium wedding ring with horizontal grooves is up to the task of celebrating this momentous occasion. Grooves never disappoint, especially in a handsome satin finish that complements the polished edges. 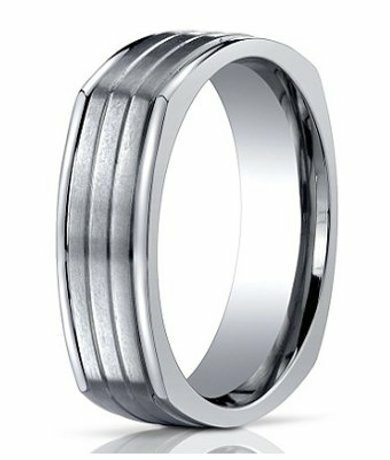 Each men’s Benchmark four-sided titanium wedding ring with horizontal grooves is available in the comfort-fit style. Comfort-fit wedding bands tend to measure a half size smaller than their traditional counterparts. We recommend that you have your finger measured by a professional jeweler before making your final decision. Please contact us with any questions or concerns, and a friendly member of our team will gladly help you every step of the way to finding your forever ring. I bought this ring for a few reasons. It's shape and design was very appealing, it was made of durable metal, it was available in a larger size and came with a lifetime guarantee. When it arrived I was very pleased with its detail, lightweight design and comfort. The purchasing transaction was smooth and I was provided tracking information as well. All around a great purchase.